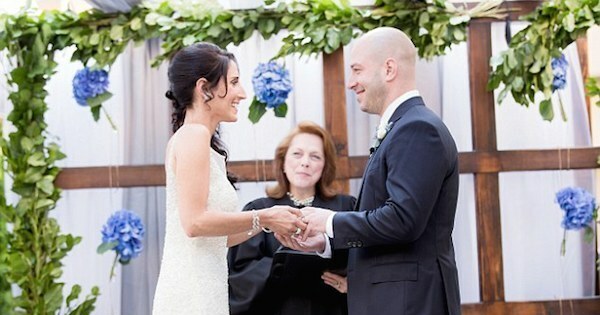 Share the post "Boston Bombing Survivor Marries The Woman Who Literally Nursed Him Back To Health"
One very special relationship has emerged from the Boston Marathon bombing of 2013: a marriage between a victim and the nurse who cared for him. James Costello, a 31-year-old bystander at the race, was caught in the midst of the bomb’s blast. He suffered severe wounds that left him facing months of surgery and rehabilitation. At Spaulding Rehabilitation Hospital, Costello met Krista D’Agostino, one of many nurses responsible for his care. The two had a connection that only grew as D’Agostino helped Costello through difficult physical therapy. D’Agostino and Costello got married this weekend at Boston’s Hyatt Regency hotel. In a December interview with the “Today” show, Costello said that the bombing brought him love. She hates when I say this, but I’m actually glad I got blown up… I got her. The words are clearly those of a man with stars in his eyes. The Hyatt director describes the couple as the “most deserving” people. Certainly after so much difficulty, Costello deserves to be happy.